Ahhhhh summertime – it’s the best time – family time, food time. swimsuit time, and grilling time. If you love coffee as much as we do, and we think you do, you’re always looking for ways to bring coffee’s caffeinated buzz to the flavor party whenever possible. 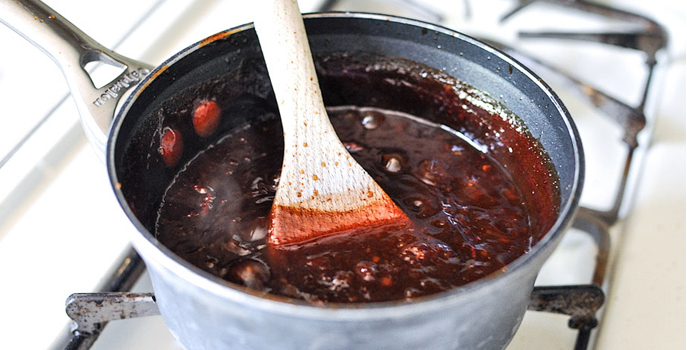 The 4th of July is a perfect time to give this coffee bbq sauce recipe a whirl. The best and bravest dads try their hand at barbecuing for their friends and family, with the sun shining and as many tiny American flags you can find flying in the wind. Our forefathers held grilling, and the individuals capable of such a task, in the highest of regard. You’re going to add your own coffee twist to your legendary barbecue by infusing that smoky, sweet goodness with some incredible freshly brewed coffee. Some may see it simply as a wet sauce to slap on some meat, but for you it is the liquid gateway to another flavor dimension. Brew your favorite coffee using your favorite method. Put the coffee, ketchup, vinegar, brown sugar, onion, garlic, chile peppers, dry mustard, Worcestershire sauce, cumin, and chili powder in a small pot. Stir them together and bring to a simmer over medium-high heat. Lower the heat so the mixture is just simmering and let simmer for 20 minutes. Puree it in a blender or food processor fitted with the steel blade. That’s it! We hope you love it, let us know in the comments below.